As most of us are aware, the early glories of Ireland and the Irish people are often overshadowed on the later end of their history by the tragic subjugation of their island by the Protestant English and by the barbarous treatment of the Catholic subjects of North Ireland (Ulster) in a manner reminiscent of the Jewish ghettos of Poland during the Nazi occupation. Most of the world watched in stunned confusion as one of the most "civilized" and wealthy nations of the West continued to wage a religious war on the Irish of Ulster for much of the 20th century. As I mentioned last time, it was as if the passions and bloodlust of the Reformation-era were still raging with their full vigor in the island that had once converted much of Europe. Ireland had been subjugated by her stronger neighbor many times. Henry II had invaded, as had Edward I. It was conquered by the Norman warlord Strongbow took it in the 1170's and set up his government at the Rock of Cashel, but it was not until the time of Cromwell that the whole of the island fell irretreivably into the hands of the English. Irish lords were driven out and replaced by English (a process called "the Ascendancy") and for two centuries the British practiced the barbaric policy of planned starvation of the Irish yeomanry to get the off of their land, making Ireland a depopulated and economically depressed place. This is in part what caused the mass Irish migrations to the new world in the late 18th and middle 19th centuries. In fact, until the 1990's, Ireland averaged about 20,000 emigrations a year, quite a large amount considering the small populace of the island. As the native Irish fled, emigrated or were starved, Protestant Scots and English were brought in to settle and cultivate the land, especially in the north, which had a closer geographic and cultural tie to Scotland and England. Ireland was formally, legally incorporated into the United Kingdom in 1801. Following the ascendancy of political liberalism in Britain from the 1880's on, many in England favored Home Rule for the Irish (this was actually the third such bill that had come to Parliament). Parliament considered a Home Rule bill in 1914, but put it off when World War I broke out. Not content to wait, the Irish revolted in the 1916 Easter Rising. Militant Irish Republicans seized a few key areas of Dublin and other strategic points and proclaimed an Irish Republic independent of Britain. The British troops moved in and put the revolt down in six days, but Republicanism became a major force in Ireland. Pro-independence Republicans won 73 seats to the British Parliament. The Home Rule act was in fact adopted, but it excluded certain unnamed portions of Ulster (now Northern Ireland). The Ulster Protestants (Unionists) violently opposed Home Rule, as it meant they would be minorities in a nation of Catholics. Meanwhile, Sinn Fein (meaning "We alone"), established in 1905, convened the first Irish parliament (Dail Eireann) and proclaimed an Irish Republic in 1919. The British government, of course, did not accept the legitimacy of the new government and from 1919 to 1921, brigades of Irish volunteers were constituted the army of the Republic by Sinn Fein and waged a guerilla war against the British Army; this group went on to become the IRA. Both sides resorted to terror, the British (called Black and Tans) burning villages and torturing those suspected of sympathizing with the IRA, while the IRA torched homes of those connected with Unionism. During these years, 34% or Ireland's Protestant population fled Eire. 1) All of Ireland would be given a semi-free status called "Dominion Status," comparable to that enjoyed by Canada. The island would be called the "Irish Free State." 2) North Ireland could opt out of the Free State if it so chose and remain united to the UK. Given the Unionist hatred for the Catholic Irish, they chose to retain their allegiance to the UK. The Irish Dail approved the treaty in 1922 and went about creating the Free State, but some dissented. A vocal minority led by Eamon de Valera asserted that the treay was unacceptable for several reasons. First, it partitioned the island. Second, the state was still not fully independent, and third, the government was still to be required to swear allegiance to the British monarch. De Valera and his supporters (including most of the IRA) left the Dail and a bloody civil war ensued until 1923, in which more Irish were killed than had been in the Anglo-Irish conflict. Eventually, the supporters of the Free State won out, and Ireland existed as a semi-autonomous constitutional monarchy, ruled titularly by the British Monarch, who was referred to as the "King of Ireland." A commission was set up to formalize the borders between the Free State and the North and was supposed to allow for Nationalists to remain in the Free State while Unionists and Protestants wound up in Ulster. However, the borders were drawn up according to economic factors instead, with the end result being that much land of the Catholic south was ceded to the North, creating a Catholic minority within Ulster. Eamon de Valera, the former anti-treatyite, campaigned against this and won Ireland's 1932 election to become president. He gradually altered the composition of the Free State and in 1937 gave Ireland a new constitution, renaming the nation simply "Ireland" and abolishing much of the political machinery set up by the British to keep the island's ties with the homeland. The British monarch was still titular head of Ireland, however. During World War II, to Irish maintained a cool neutrality, not wanting to expend their blood to aid the English, whom they feared would come out too powerful after the war and use their force to resubjugate Ireland. Though the island was officially neutral, it provided tacit support to the Allies. But just so the British did not get too comfortable, it also gave subtle support to the Axis (following the suicide of Adolf Hitler, de Valera, following diplomatic protocol, controversially offered condolences to the German ambassador). Finally, On 1 April 1949, the Republic of Ireland Act was enacted. The new state was unambiguously described as a republic, with the international and diplomatic functions previously vested in or exercised by the King now vested in the President of Ireland who finally became unambiguously the Irish head of state. Though the official name of the state remained Ireland, the term Republic of Ireland though officially just the 'description' of the new state, came to be commonly used as its name. Under the Commonwealth rules then in force, the declaration of a republic automatically terminated the state's membership of the British Commonwealth. Unlike India, which became a republic at the same time, the Republic of Ireland chose not to reapply for admittance to the Commonwealth. This came about not so much from the UK's desire to free Ireland as much as from succumbing to the anti-colonial atmosphere that was leading nations all over the world to grant independence to their colonies. Ireland was free at last. But not so in the North. The North, six counties representing over a million people and almost a third of the nation's populace, remained under Great Britain and subject to pre-1920 laws and institutions. The same 1949 Ireland Act that freed the South also stated that the North would remain united to England. De Valera, always opposed to a divided nation, wanted to reunite with the North, as did many in the South. In 1973, a plebscite was held in which the populace of the North (mainly Unionists, but with a substantial Catholic minority) voted whether or not to join the Irish Republic and 98% voted in favor of the status quo (though it should be noted that many Catholic Nationalists boycotted the election). Meanwhile, trouble had been brewing in the North, beginning around 1968 when the Northern Ireland Civil Rights Association began marching and protesting for more civil rights for Catholics and Nationalists. Hitherto, Catholics had been gerrymandered into a few electoral wards to curb their voting power, and Nationalists as well as Catholics were subject to the "Special Powers Act," by which martial law could be enacted if the peace was threatened. Though the North was plagued by both Unionist and Nationalist agitators, the law was almost uniformally invoked against the Catholics. O'Neill, Prime Minister of the North, promised reform, but a hardline of Catholic-hating Unionists led by Ian Paisley formed up behind O'Niell and accused him of selling out to the papists. Paisley was supported by thousands of Unionists who resented the idea of Catholic equality in a Protestant state. The first violence erupted in 1969 when a Unionist group staged a bombing an unsuccessfully attempted to frame the IRA for it. Vicious sectarian riots broke out all over the North, and in Belfast, over 1500 Catholic families were turned out of their homes and seven were killed by Protestant mobs. The IRA was criticized for failing to protect the persecuted Catholics during these assaults. Northern Ireland petitioned the UK to send in troops to restore order in the North, and Britain complied with this request. The Army restored order, but used such heavy-handed tactics that they quickly made more enemies and created more tension, especially since they were widely known to be in sympathy with the Unionists. In response, the IRA reformed itself in 1969 and began a counter-offensive in the North against the British Army and the Northern Police. Violence was at its peak from 1970-1972, and in 1972 alone 500 people were killed. In 1971, internment without trial was instituted, and of 350 people arrested under the new code, not a single one was Protestant. Between 1971 and 1975, 1,981 people were detained; 1,874 were Catholic/republican, while 107 were Protestant/loyalist. There were widespread allegations from the nationalist community of abuse and even torture of detainees. In 1972, the British Army in Derry shot and killed 14 unarmed demonstrators in an incident that became known as Bloody Sunday. Many of those killed were found to be shot in the back while running away. 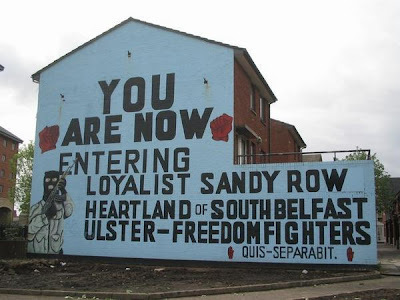 The IRA retailiated with a series of bombings in Belfast, which provoked the creation of the Ulster Defense Association, a newly formed group which went around assasinating Catholics, all of whom were lumped together as Nationalists. These murders produced much outrage, especially those of the Shankhill Bucthers, who tortured their victims before killing them. Neighborhoods became segregated, with Protestants fleeing Catholic areas and vice versa. The Catholics who could not felle from Protestant areas were penned up in ghettos surrounded by walls and fences. To control the violence, London suspended the Ulster government and instituted Direct Rule from London in 1972. After this, a coalition based on a conciliatory treaty called the Sunningdale Treaty emerged promoting cooperation between Unionists and Nationalists, but it quickly collapsed in 1974 following massive protests from radical Unionists who were against any collaboration with the Catholics. In 1976, the IRA resumed violence and prepared for what it called the "Long War," a sustained programm of guerilla war against the British that could be carried on indefinitely. Britain attempted to end the crisis in North Ireland, but upon being unable to restore order, it simply attempted to "normalize" the bizarre situation there with a series of reforms. For example, internment without trial was abolished in 1976, but paramilitary Nationalists were still being tried without juries, ostensibly to protect juries from intimidation. In 1980 and 1981, the IRA prisoners went on a series of hunger strikes that won wide support for the Catholic cause, especially after ten strikers starved themselves to death in 1981. The violence dragged on intermittently, leaving North Ireland desolate and depressed, until a 1994 cease fire was called. Part of the problem in the North was that members of local police and governmental agencies by day were members of paramilitary organizations by night, who continued to assasinate Catholic civilians. By this time, both the Protestant and Catholic civilian populations were weary of the violence and a peace was brokered in 1994, but in the year leading up to the agreement there were many more atrocities, including an increase in the number of Catholic civilians murdered. The IRA responded with more bombings, and then this was in turn followed by more random shootings of Catholic civilians. But finally, the IRA declared a cease-fire in August 1994, reciprocated by the radical Unionists a few weeks later. However, the UK continued to drag its feet in the peace process, and the IRA started another bombing campaign in 1996, destroying the large downtown of Manchester in the largest bombing in Britain since World War II. The last soldier of the British killed by the IRA was killed in 1997, shortly before the IRA called their next cease-fire. As Sinn Fein was invited to talks (the so-called Mitchell Principles), many groups on both sides split as it became evident that an agreement was within reach. 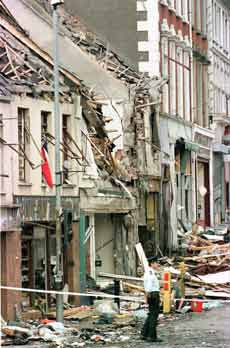 The IRA began bombing again, this time discrediting themselves because of 29 civilians killed in their 1998 bombing in Omagh. In 1998, self-government was restored to the north on a coalition basis between four organizations, Sinn Fein being one of them. The Republican elements of the struggle have become much less violent, except for occasional internecine warfare against their own members and traitors. The Ulster organizations, like the UDA, have turned to organized crime as a way to maintain power and influence in their cities. Violence almost broke out in 2002 over the exposure of an IRA spy ring in the government, but the agent in questions (Denis Donaldson) was the only casualty, murdered by the IRA. Though actual violence has ceased, animosity is still high, and the Catholic and Protestant neighborhoods remain extremely segregated. Violence occaisonally breaks out when the group known as the Orange Order makes its annual march throughout North Ireland. The Order is a group dedicated to celebrating the victory of William of Orange in 1690 at the Battle of Boyne that caused Ireland to pass into the hands of the Protestant English (William also ousted the Catholic James II in the so-called "Glorious Revolution" of 1688). Since 1969, 3,523 people have been killed in Northern Ireland, most in Belfast. Occasionally, violence still flares up; 3 people were killed in 2006. North Ireland remains subject to Protestant Great Britain with its Catholic population segregated and subject to much social persecution from the dominant Unionist majority. Unfortunately, Sinn Fein, the supposedly "Catholic" party in occupied Ireland, are pro-abortionists. Yes, unfortunately, that is what happens when Catholicism becomes more about culture and ethnicity and nationalism than about Faith. "As I mentioned last time, it was as if the passions and bloodlust of the Reformation-era were still raging with their full vigor in the island that had once converted much of Europe." The Reformation *is* the catalyst behind the last 500+ years of European history. It's effects are still apparent today; and have spread all over the world. I've read history books whose first sentence is something like the following: "The history of modern Europe is the direct result of the Reformation." Could Oprah be the Antichrist?